The 2019 Bucks for the Broncos, online auction is now LIVE!!! Auction runs March 24 through April 16, 2019 at BiddingForGood.com! 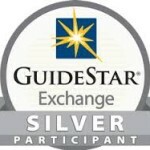 We have Disney, SeaWorld, Balboa Park, Belmont Park, Coronado Playhouse, and much, much, more. Click the button to below to visit the auction and BID, BID, BID! Thank you all for joining us for a fun afternoon to uncork, sip back, and relax all while effortlessly supporting the RBHS Library. Thank you, KoiZen, for hosting and helping us raise money for the RBHS Library. Making friends, tasting great wines and raising money for the kids! Launch of the New Makerspace! Thanks to a $24K Community Improvement grant issued by the San Diego County Supervisor’s Office, Kristin Gaspar, RBHS has opened its new MakerSpace which includes many hands-on activities including 3D design and printing on 2 MakerBot Replicator+ 3D printers. Our own Liz Schwartz wrote the winning request for the Library and continues to bless the FOL with her amazing service. On behalf of the RBHS Friends of the Library Board of Directors, a heartfelt “Thank You” to Attorney, Keith Greer, for his many years of support for our RBHS students who participate in the RBHS FOL Annual Poetry Contest. Pictured left to right- Frances French, RBHS FOL Secretary, Attorney Keith Greer and June Zhou, RBHS FOL President. The RBHS Friends of the Library was formed to fill the gap of funding which occurred during financial instability in the early 2000s. 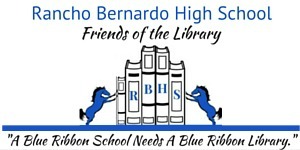 Our goal is to support the mission of the Rancho Bernardo High School Library in empowering students to be critical thinkers, enthusiastic readers, skillful researchers, and ethical users of information in the digital age via fundraising and advocacy. As funding for schools increases, our students are reading more than ever, with over 20,000 book checkouts last year alone. And our kids aren’t just reading fiction. Over 60% of materials checked out last year were non-fiction texts. They are both reading for pleasure and reading for learning. The Friends of the Library has raised over $225,000 over the last ten years to help support a strong library collection and additional library staffing in our collective efforts increase student literacy and develop a passion for learning. Help RBHS Students and RBHS Friends Of the Library and Get Involved! If you love the impact our school’s library is having on our students, this is the best way to stay in the loop on all things RBHS FOL. Our multiple events held throughout the year are designed to help the RBHS FOL impact the Rancho Bernardo High School’s Library continued growth and improvement for our students. All the details straight to your inbox. Student breakthroughs happen every day here in the library, and we love sharing them from every month. Don’t miss the next one! Thanks for joining the RBHS Friends of The Library newsletter! RBHS students and teachers are encouraged to use the library’s extensive curriculum-tailored book collection and our online databases. Use of our online databases, such as Gale Student Resource Center, gives students access to thousands of quality articles in E-reference collections, online journals and popular and academic magazines. Use Discovery Education to view or download educational video clips and images. These resources have been selected to help our students do even better. RBHS Students receive instruction on: The Research Cycle * Developing questions * Using graphic organizers * Using the library catalog * Using books for research * Reading for information * Thesis statements * Creating an outline Evaluating websites and sources * Using on-line databases * Organizing research * Citing sources in MLA * Avoiding Plagiarism * Making storyboards * Shooting & Editing videos * Redundancy * Manipulating video * Prezis and PowerPoints * Using Excel & MS Word * Media Literacy * …..and much more. Enjoy your favorite ebooks and audiobooks in the mobile app, or on your computer. Overdrive desktop app supports transfer to a variety of devices and in many cases, burning to CD for listening on the road. With OverDrive, you can borrow and enjoy free eBooks, audiobooks, and more from our school’s digital collection. All you need to get started is an internet connection and a student ID. Click here to get started. Gale supports today’s students by delivering authoritative, curriculum-aligned content through innovative digital technology designed to improve engagement, encourage collaboration and foster critical thinking. Click here to connect to RBHS Gale databases. RBHS students used our library to become information producers not just information consumers or information movers. Numerous classes were involved in producing research thesis papers and public service announcement video projects. While much of the production is done electronically, the focus is always on the critical thinking: students reading, gathering evidence to support a position. Outlines are created and notes are taken using electronic note cards-part of the NoodleBib program. NoodleBib electronic note cards enable students to copy quotes, paraphrase the quotes and record their own ideas. Note cards are tagged and can be put into piles and sorted electronically. Students record their source s in the same program and tie the source to the note card to keep attribution correct. Students can then drop their note cards into their outline prior to writing their first draft. To extend their research beyond the thesis paper, Mr.Trecker had his students produce storyboards and shoot PSA videos. Videos were edited on our iMac computers and finished products were uploaded to Youtube and shared in the reference room. of thousands of institutions worldwide, representing millions of end users. Click here to connect to RBHS EBSCO databases. Students can scan documents to a flash-drive and print in either color or black & white to our high quality laser printers through an in-house VendPrint system. A Special Thank You To Supervisor Kristin Gaspar For Your Support!